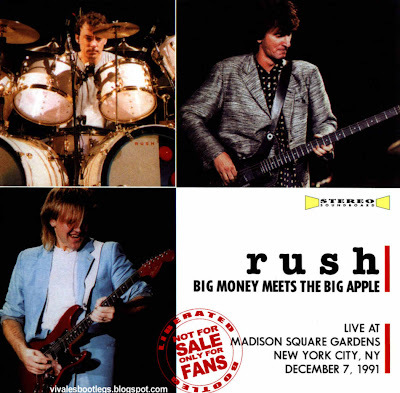 Recorded Live at Madison Square Garden, New York, NY, USA - December 07, 1991. Excellent Soundboard Recording :: Bootleg Silver CD/s :: CBR 320 kbps & Lossless. Files: 20. :: Size: 244,77 MB (mp3) / 722 MB (lossless). 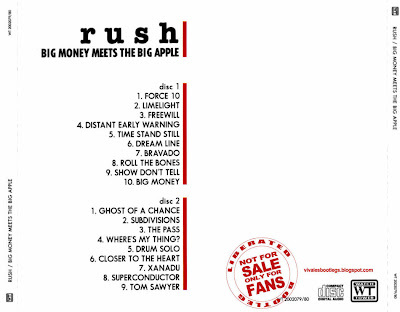 Notes: LeeGeddy( Audio - 10) - Third installment of Rush bootlegs from Watchtower and it's a great one. Sound is fantastic with crisp highs and a nice punchy midrange presence. In July '02, Digital Reproductions released its version of this show, but from a higher (and unverified) generation source in comparison to the one used by WT. It's been rumored that WT shows are sourced from someone very close to Rush, but who knows whether these rumors are true or not. This show is from the 2nd night at the MSG (as Geddy states) and it's a good one with only few minor hiccups by Alex. The ONLY drawback to this wonderful source is the entire Encore is missing. DR's "Garden Road" represents the full show, although the sound quality is slightly lower than this source. This is a great addition to anyone's list.<-(Info taken from digitalrushexperience.com). All tracks lossless in SHN format. Hello! Congratulations for this great blog!! I really like it and almost all bootlegs posted here. But I want to complaint, indeed, I would like to ask if is really necessary to put that text on lyrics tags for each music that you posted here? It is really annoying using iPod, iPhone, iPad or other device or application which shows lyrics to see that text ... actually I need to remove all text from lyrics tags manually ... 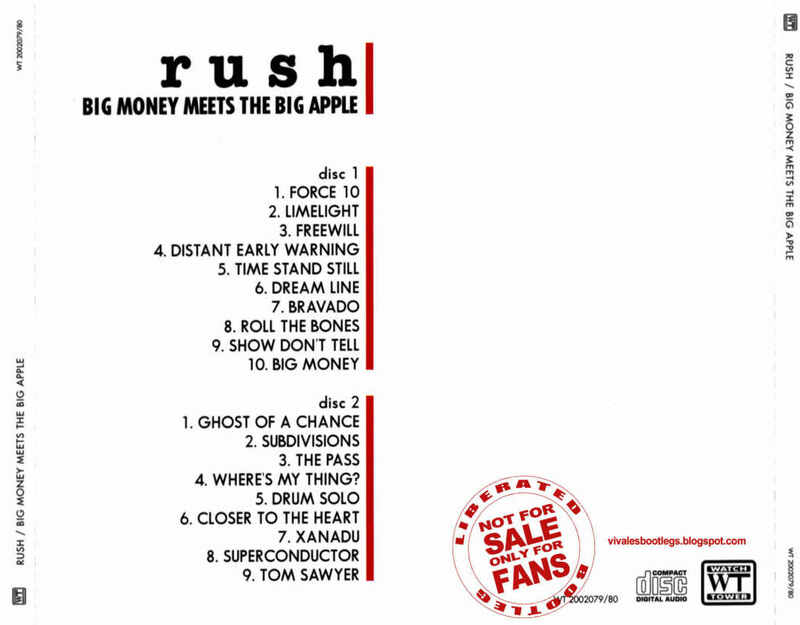 Imagine do this for 26 musics like in the fantastic Rush's bootleg ?? hey bro. how are you supposed to decompress shn. it's always a bugger.. is there a device that turns it into wav. or mp3? yours, turtle. EXCELLENT !!!! A BIG THANX from Bucharest/Romania ! Thanks for this boot !